Stray capacitance on op amp inputs is a problem that circuit designers are always trying to get away from because it decreases stability and causes peaking. The circuit shown in Figure 7-17 has some stray capacitance (Cq,) connected from the inverting input to ground. Equation 7-18 is the loop gain equation for the circuit with input capacitance. 1/(RF||RGCG) Pole moves close to t2 the stage is set for instability. Reasonable component values for a CMOS op amp are RF = 1 MQ, RG = 1 MQ, and CG = 10 pF. The resulting pole occurs at 318 kHz, and this frequency is lower than the breakpoint of t2 for many op amps. There is 90° of phase shift resulting from t1, the 1/(RF||RGC) pole adds 45° phase shift at 318 kHz, and t2 starts to add another 45° phase shift at about 600 kHz. This circuit is unstable because of the stray input capacitance. The circuit is compensated by adding a feedback capacitor as shown in Figure 7-18. The loop gain with CF added is given by Equation 7-19. If RgCg = RfCf Equation 7-19 reduces to Equation 7-20. The compensated attenuator Bode plot is shown in Figure 7-19. 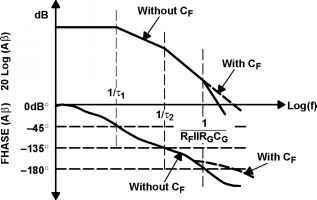 Adding the correct 1/RfCf breakpoint cancels out the 1/RGCG breakpoint; the loop gain is independent of the capacitors. Now is the time to take advantage of the stray capacitance. CF can be formed by running a wide copper strip from the output of the op amp over the ground plane under RF; do not connect the other end of this copper strip. The circuit is tuned by removing some copper (a razor works well) until all peaking is eliminated. Then measure the copper, and have an identical trace put on the printed-circuit board. The inverting and noninverting closed-loop gain equations are a function of frequency. Equation 7-21 is the closed-loop gain equation for the inverting op amp. When RFCF = RgCg, Equation 7-21 reduces to Equation 7-22, which is independent of the breakpoint. This also happens to the noninverting op amp circuit. 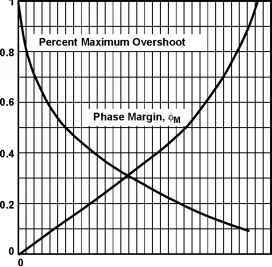 This is one of the few occasions when the compensation does not affect the closed-loop gain frequency response.